The OontZ Angle 2 PLUS Edition allows you to listen to music, videos and games wirelessly from your Bluetooth device in high quality with deep rich bass and surprising volume. The OontZ Angle 2 PLUS Edition works wirelessly with almost all Smartphones, tablets and other Bluetooth enabled devices. The rechargeable battery will provide up to 15 hours* continuous listening, from a fully charged battery. The OontZ Angle 2 PLUS Edition is designed to be splash-proof and dust resistant and it is certified to the IPX5 standard** for waterproofing, making the OontZ Angle 2 PLUS Edition the perfect speaker for taking to the beach and listening by the pool. With the built-in microphone you can use your OontZ Angle 2 PLUS Edition as a wireless hands free personal speaker phone when connected by Bluetooth to most Smartphones. You can also listen to PCs, laptops, Apple computers and non-Bluetooth devices by connecting them to the OontZ Angle 2 PLUS Edition with the included 3.5mm Audio cable. The OontZ Angle 2 PLUS Edition can support a wireless Bluetooth connection, up to 30 unobstructed feet away from your device. *Battery play time varies and may be less than 15 hours for a number of reasons including the listening volume (the louder the volume, the shorter the play time), the device, Bluetooth connection, and music genre and music source. The 15 hours was determined with a fully charged OontZ Angle 2 PLUS Edition set at approximately 50 percent of the maximum volume. ** The IPX5 certification test consists of low pressure Water projected by a nozzle (6.3 mm) from all directions, without resulting in a harmful effect to the speaker. It is not submersible and should never be placed in or under water, this could result in irreparable damage to the speaker. Both 1. The AUX-In Jack and 2. The Micro USB Charging port are located under the rubber flap on the right side of the OontZ Angle 2 PLUS Edition. Open the flap from the top, by gently down on the flap and pulling gently to open. The bottom of the flap is attached to the speaker. The flap is tightly fitted to the speaker to help prevent water or dust getting into the connectors. 1. AUX-In Jack – This jack if for listening to non-Bluetooth devices or your laptop or computer by inserting one end of the included 3.5mm audio cable into the jack and the other end of the cable into the headphone jack on your laptop, computer or device. 3. Microphone - This is the microphone that is used for the hands-free speaker phone feature. 4. Charging indicator light – This light will flash very slowly red when the OontZ Angle 2 PLUS Edition is being charged. The light will be solid red when the OontZ Angle 2 PLUS Edition is fully charged. When the OontZ Angle 2 PLUS Edition is playing and the battery charge is low the light will begin to flash red, and you should charge your speaker. 5. The on/off button – Press and Release the button to turn on the OontZ Angle 2 PLUS Edition; Press and Hold down the button for three to five seconds to turn off the OontZ Angle 2 PLUS Edition, until the light/s on top off the speaker turn off. 7. Bluetooth (and phone) Button - This is dual function button: It is for putting your OontZ Angle 2 PLUS Edition into pairing mode for switching to a different Bluetooth device; and it use to answering and end a phone call. To put the OontZ Angle 2 PLUS Edition into pairing mode to switch to a different device, Press and Hold the button down for about 3 to 5 seconds until the blue light flashes on and off, the speaker is then ready to pair to the next Bluetooth device. To answer an incoming phone call Press and Release the Bluetooth button. To end a phone call Press and Release the Bluetooth button. 8. Play/Pause Button – Press and Release the button to Pause your music; Press and Release the button to resume playing your music Note: This feature works when connected in Bluetooth wireless mode. It does not function when using the AUX-IN cable. 9. Volume Down Button – To lower the volume you can either, Press and Hold the button down until the volume reaches the desired level or to reduce the volume more quickly, you can Press and Release the button multiple times. When the volume reaches the lowest level the red light on top of the speaker will flash once. 10. Volume UP Button - To increase the volume you can either, Press and Hold the button down until the volume reaches the desired level or to increase the volume more quickly, you can Press and Release the button multiple times. When the volume reaches the highest level the red light on top of the speaker will flash once. The OontZ Angle 2 PLUS Edition has a Lithium Ion rechargeable battery inside. To charge it, plug the micro connector end of the USB cable into the Micro “USB” charging port on the side of the OontZ Angle 2 PLUS Edition and the other end into a USB charging source. The source can be either from your desktop, laptop, or Smartphone USB wall Power Adapter (not included). The Charging Indicator Lighton the top will flash red very slowly while charging. When the OontZ Angle 2 PLUS Edition battery is fully charged, the charging indicator light will be solid red. The battery will take about 3 to 4 hours to fully charge. Note 1. When the battery is low the red light will begin to flash, this indicates that the OontZ Angle 2 PLUS Edition requires charging. Note 2. You may use your OontZ Angle 2 PLUS Edition while it is charging. Note 3. It is recommended that you remove the charging cable after the OontZ Angle 2 PLUS Edition is fully charged. ** When fully charged, the OontZ Angle 2 PLUS Edition can play audio for up to 15 hours. This play time may vary for a number of reasons including; the volume (louder volume results in shorter playtime), device, connection (aux or Bluetooth), and music type. Step 1 – Make sure your OontZ Angle 2 PLUS Edition has sufficient charge or connect to a charging source. Press and Release theON/OFF button to turn the speaker on. Step 2 – Put the OontZ Angle 2 PLUS Edition into pairing mode by Pressing and Holding down the Bluetooth button for 3 to 5 seconds, until the Pairing Indicator light on the top of the OontZ Angle 2 PLUS Edition is flashing blue. The blue flashing light indicates the OontZ Angle 2 PLUS Edition is in pairing mode. Step 3 – Enable the Bluetooth function on your device and then search/scan for the OontZ Angle 2 PLUS Edition. When the OontZ Angle 2 PLUS Edition appears on the list select it and your device will pair. Make sure it says “connected” next to the “OontZ Angle 2 PLUS Edition” on your device. Very few devices will request a password, if your device does enter “0000” (four zeros). Step 4 – The Pairing Indicator light will switch to solid blue when the OontZ Angle 2 PLUS Edition is paired and connected. Step 5 – You can now wirelessly play your music and audio from videos, games and movies. You can use your device to control the audio and you can use the “VOL+” Button and the “VOL-” Button on the OontZ Angle 2 PLUS Edition to control the volume. Note 1. The OontZ Angle 2 PLUS Edition can only be connected to one device at a time. You will need to disconnect the first device from the OontZ Angle 2 PLUS Edition before trying to pair to another device: Press and hold the Bluetooth button for 3 to 5 seconds for the speaker to enter pairing mode, it will disconnect from the current device when entering pairing mode. The blue light will flash indicating the device is disconnected and the OontZ Angle 2 PLUS Edition is in pairing mode. You can then pair and connect to the next device. Note 2. The OontZ Angle 2 PLUS Edition will automatically try to pair to the last connected device each time the OontZ Angle 2 PLUS Edition is turned on and that device is or comes within range. If the OontZ Angle 2 PLUS Edition successfully connects to the last device it will prevent any other device from pairing to it, until that current device is disconnected. When the OontZ Angle 2 PLUS Edition is connected to your Smartphone via Bluetooth you will have the Wireless hands-free speaker phone feature enabled. Answering an incoming call: To answer a call on the OontZ Angle 2 PLUS Edition, Press and Release the Bluetooth button once. Rejecting a call: To reject a call Press and Hold the Bluetooth button for about 3 seconds. Switching from the hands free speaker phone to your smartphone: this has to be done on the phone itself. Ending a call: To end a call Press and Release the Bluetooth button again. Note: 1. An incoming call will be heard on the OontZ Angle 2 PLUS Edition and your voice will be picked up by the inbuilt microphone. Please keep the speaker close in front of you so you may be heard clearly by the listener. 2. The Personal Speakerphone feature is enabled in Bluetooth mode only, this feature does not function when using an AUX IN connection to your phone. 3. For some smartphones the call/phone Bluetooth audio needs to be enabled as well as media audio to use the speaker phone feature. For your device, laptop, tablet or PC that does not have Bluetooth or cannot support Bluetooth audio, you can play audio by connecting the included 3.5mm audio cable in from your device to the “AUX IN” Jack located on the side of the OontZ Angle 2 PLUS Edition. Step 1 – Turn on the OontZ Angle 2 PLUS Edition. Make sure your OontZ Angle 2 PLUS Edition has sufficient charge or is connected to a charging source. Step 2 – Plug one end of the 3.5mm audio cable into the “AUX IN” Jack on the side of the OontZ Angle 2 PLUS Edition and plug the other end into the headphone/audio out jack on your audio source. You can now play your music and audio on the OontZ Angle 2 PLUS Edition. IMPORTANT NOTE: When you are using the AUX IN mode on the OontZ Angle 2 PLUS Edition, the audio through the aux cable will take over Bluetooth and a Bluetooth device will not be able to play audio. You will need to remove the 3.5mm audio cable from the OontZ Angle 2 PLUS Edition to play audio from a Bluetooth device. Make sure the OontZ Angle 2 PLUS Edition battery has sufficient charge. If the battery is fully drained, a computer USB may not have sufficient power to charge the OontZ Angle 2 PLUS Edition. Try charging it from a USB wall adapter for at least 3 hours. 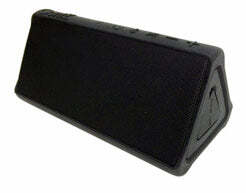 Your Bluetooth device maybe out of range, try to move closer to your speaker to within 30 unobstructed feet. Make sure the OontZ Angle 2 PLUS Edition is not currently connected to any other device. You will need to disconnect the other device from the OontZ Angle. Make sure the OontZ Angle 2 PLUS Edition is in pairing mode, the blue light should be flashing. Make sure the OontZ Angle 2 PLUS Edition is not currently connected to any other device. Disconnect the other device from the OontZ Angle 2 PLUS Edition. Make sure volume is up on your device and the OontZ Angle 2 PLUS Edition. Turn the OontZ Angle 2 PLUS Edition off then on again. If your device is connected to another Bluetooth accessory, this may interfere with the pairing process, make sure your device is not connected to any other Bluetooth accessory when pairing to the OontZ Angle 2 PLUS Edition. Make sure the OontZ Angle 2 PLUS Edition is not currently connected to any other device. Disconnect the other device from the OontZ Angle. Turn the OontZ Angle 2 PLUS Edition off and back on. Remove the OontZ Angle 2 PLUS Edition from the Pairing list on the device, restart the device, and then repair. Make sure the volume is up on your OontZ Angle 2 PLUS Edition. Turn your OontZ Angle 2 PLUS Edition off and back on. If you’re MacBook, iPad, PC or tablet has an option to select stereo or Mono select Stereo. It may be that you need to re-pair the OontZ Angle 2 PLUS Edition with your device. Remove it from your paired devices list, restart the device/computer, and then follow the steps to re-pair the speaker. Increase the volume level on the OontZ Angle 2 PLUS Edition and the device. Make sure the 3.5mm audio cable is fully inserted into the OontZ Angle 2 PLUS Edition and device. The OontZ Angle 2 PLUS Edition does not require drivers, and there are none for it. then the appropriate steps in the user guide to pair and connect to your computer. The OontZ Angle 2 PLUS Edition has an automatic shut off feature after 15 minutes of no audio being played through it. a. CAUTION: Danger of explosion if battery is incorrectly replaced. Replace only with the same or equivalent type. b. A warning that batteries (battery pack or batteries installed) shall not be exposed to excessive heat such as sunshine, fire or the like. c. Correct Disposal of this product. This marking indicates that this product should not be disposed with other household wastes throughout the EU. To prevent possible harm to the environment or human health from uncontrolled waste disposal, recycle it responsibly to promote the sustainable reuse of material resources. To return your used device, please use the return and collection systems or contact the retailer where the product was purchased. They can take this product for environmental safe recycling. 1. Read these instructions – All the safety and operating instructions should be read before this product is operated. 2. Keep these instructions – The safety and operating instructions should be retained for future reference. 3. Heed all warnings – All warnings on the appliance and in the operating instructions should be adhered to. 4. Follow all instructions – All operating and use instructions should be followed. 5. Do not use this apparatus near water – The appliance should not be used near water or moisture – for example, in a wet basement or near a swimming pool, and the like. 7. Do not block any ventilation openings. Install in accordance with the manufacture’s instructions. 9. Do not defeat the safety purpose of the polarized or grounding plug. A polarized plug has two blades with one wider than the other. A grounding plug has two blades and a third grounding prong. The wide blade or the third prong is provided for your safety. If the provided plug does not fit into your outlet, consult an electrician for replacement of the obsolete outlet. 10. Protect the power cord from being walked on or pinched particularly at the plugs, convenience receptacles, and at the point where they exit from the apparatus. 12. Use only with the cart, stand, tripod, bracket, or table specified by the manufacturer, or sold with the apparatus. When a cart or rack is used, use caution when moving the cart/apparatus combination to avoid injury from tip-over. 14. Refer all servicing to qualified personnel. Servicing is required when the apparatus has been damaged in any way, such as power supply cord or plug is damaged, liquid has been spilled or objects have fallen into the apparatus has been exposed to rain or moisture, does not operate normally, or has been dropped. - This lightning flash with arrowhead symbol within an equilateral triangle is intended to alert the user to the presence of non-insulated “dangerous voltage” within the product’s enclosure that may be of sufficient magnitude to constitute a risk of electric shock.